What’s in the New Indonesia South China Sea Base Hype? A recent development has spotlighted Jakarta’s ongoing efforts to upgrade and integrate its existing capabilities to address a range of threats. Indonesia’s official announcement last month of an expanded security presence in the Natuna Islands near the South China Sea attracted significant headlines in the country and beyond. The development spotlighted Jakarta’s ongoing efforts to upgrade and integrate its existing capabilities in the defense realm to address a range of threats despite the challenges that remain. The idea of an Indonesian military presence in the Natuna Islands in general and with respect to the South China Sea in particular is far from new. Indeed, as I have noted before in analyzing Indonesia’s approach in these pages and elsewhere, the resource-rich Natuna Islands, located in the southern end of the South China Sea northwest of Borneo, has long been factored into Indonesia’s security thinking. Though this is due to an array of concerns relating to the country’s borders, including with respect to its neighbors, one key consideration stems from the fact that even though Jakarta is not officially a South China Sea claimant, China’s nine-dash line overlaps with the exclusive economic zone (EEZ) around the Natunas. Recent years have seen an even greater focus on Indonesia’s approach towards the Natunas and the South China Sea, with a number of high-profile incidents involving Indonesian and Chinese vessels and the government of Indonesian President Joko “Jokowi” Widodo taking various economic, legal, and security measures to reinforce Indonesia’s position there. On the defense side, officials have been exploring options for upgrading defense facilities, stationing more aircraft and personnel, and constructing new, integrated facilities, some of which has been publicly announced on occasion. Increasingly, Indonesia has also been attentive to not just upgrading capabilities, but also ensuring greater integration between various military services and aspects of security presence, extending out to the distribution of information and engagement of the local population. Last month, Indonesia’s attention to the Natunas and the South China Sea more generally was in the spotlight again with the unveiling of an increased presence in the Natuna Islands that had long been mulled. On December 18, an inauguration ceremony was held to officially mark the beginning of what was characterized as a new integrated military unit in the Natuna Islands near the South China Sea. Indonesian Air Chief Marshal Hadi Tjahjanto, who presided over the ceremony alongside other personnel, cast the development as part of a broader effort by Indonesia to increase its deterrence against a range of threats, including those against its borders which threaten its sovereignty and territorial integrity which have included illegal fishing and transnational crimes. He also offered some specifics on the nature of the unit, with a view to it comprising a few hundred personnel from across services that would be utilizing facilities including a port, hangar for military aircraft, and a hospital. 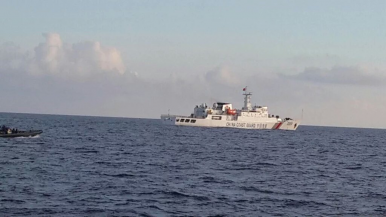 Unsurprisingly, the development was cast in the headlines as being tied primarily or exclusively to the country’s posture in the South China Sea and directed against China. But beyond the headlines and more substantively, it is in fact difficult to assess exactly what this would mean for Indonesia’s military presence in the area and how it affects its approach to a range of security issues including the South China Sea. For one, as I’ve observed before, there are still significant structural constraints to the military aspects of Indonesia’s South China Sea approach and its defense modernization more generally, and many of these are related not just to the capabilities it has, but also other variables including operating concepts, organizational structure, and interagency relations. For another, while Tjahjanto did offer some details on the nature of this integrated military unit and the general vision for it, he unsurprisingly did not provide specifics such as the exact number of personnel which would be important to evaluating this. Given all this and more, it will take some time to truly assess the significance of this development, alongside broader developments in Indonesia’s approach in the South China Sea and towards its military modernization more generally. Any assessment should also recognize what can be lost in the headlines: That for all the focus on this new development in isolation, a key driver of Indonesia’s increasing security presence and military modernization has been an attempted emphasis on integration in spite of challenges therein, including boosting interagency coordination and setting up regional joint commands. That’s worth keeping in mind when we see headline-grabbing developments such as these, as notable as they may be. What’s in Indonesia’s New Natuna Fishing Zone in the South China Sea? A recent statement has spotlighted Jakarta’s ongoing efforts in this respect.